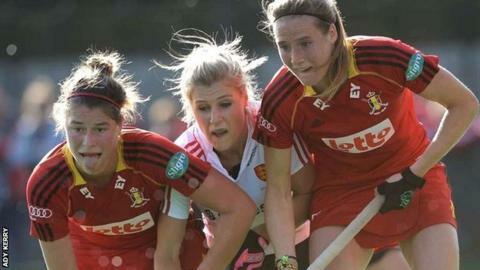 England's women continued their preparation for the Hockey World Cup later this month with a 3-0 win over Belgium at Bisham Abbey. The home side, ranked nine places higher than Belgium at three in the world, gave a convincing display. Birmingham University's Lily Owsley scored twice and Beeston's Ellie Watton once, before England also won a post-match penalty shuffle trial 4-3. The two teams will meet again on Saturday in an uncapped friendly. "There are still a lot of things to improve, but we're making progress in all areas," said head coach Jason Lee. "It was satisfying to beat a good team 3-0, especially considering that they've just come away from playing in the Champions Challenge in Glasgow last week."